Jack Nash and Ryan Stahl show off a nice grade dorado. Tim Farmer got in on the dorado action too! A nice big ‘un caught by Frank Fink! Tim and a nice dorado! 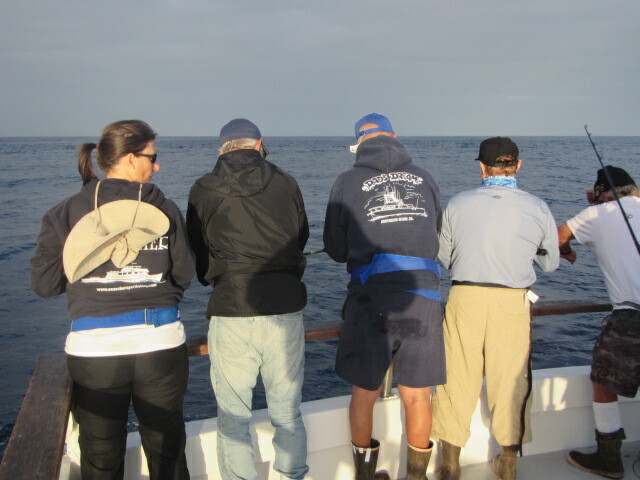 Waiting for a shark-free tuna to surface! Kim caught a nice yellowtail! Tim caught a good one, with Capt Aaron on the assist. Tim F. shows off a nice yellow. Gary’s yellowfin on the scales! Grandpa Jack and grandson Austin share their Searcher tradition! Tim Farmer doing battle at the rail!